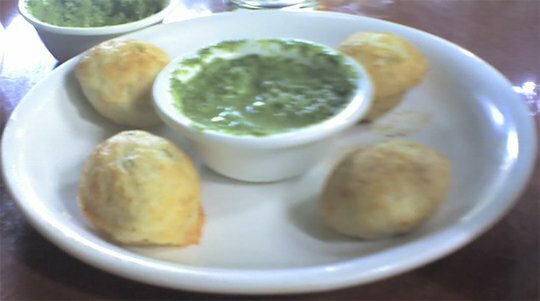 ‘Appe’ is commonly prepared in Southern India and Maharashtra. 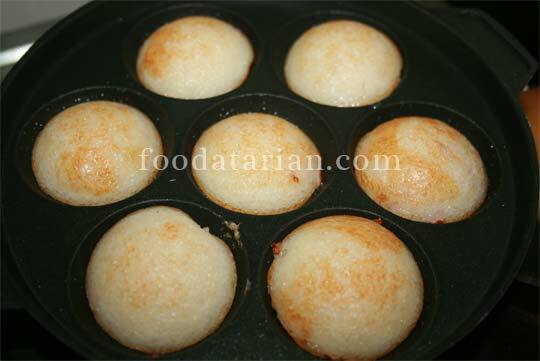 The batter is similar to that of ‘idli’ but this recipe could be prepared as sweet too. Will post that recipe soon. This is the traditional savory recipe for appe. The photo posted here was taken at one of the South-Indian joints we visit regularly. Wash rice and dal and soak in water for around 6-8 hours. Add them to Then wash poha and add them to the rice and urad dal. Grind all of them to a smooth batter (add water as required) with same consistency as the dosa batter. Transfer to a container, cover and let it ferment for around 6-7 hours. Then heat the appe pan (pan with small round despressions similar to the muffin pan), add 2-3 drops of oil in each depression and then scoop a spoonful of batter and drop it into each such depression. Cover and cook for 4-5 minutes or until they start to turn golden brown from bottom. Flip them over and drop some more oil from the sides. Cook for around 2-3 minutes and remove from the pan. Repeat these steps. Serve with coconut chutney.